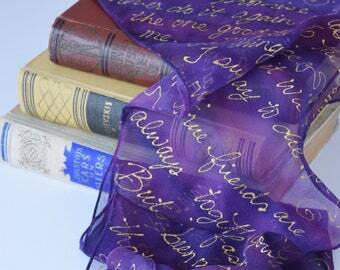 Announcement Silk scarves, neckties and veils handpainted for every occasion. Silk accessories are perfect to add color to any outfit. Shop now to choose what you want to accessorize with this spring and summer. Want something unique? Let's do a custom item just for YOU. Send me a convo today! Style is as unique as the wearer- and each hand painted silk accessory can be a symbol of who you are! All of my items come ready to gift and can be especially gift wrapped and sent directly to the address you need. I can also include a gift card with your message - just include your desired text in the "notes" section at checkout. Every item can be personalized with a special message from YOU or a date of some special occasion! Why silk? You may find yourself thinking you can live without the luxury of a silk scarf or tie. You may think, those are for those elite folks who have extra money to spend. You may think, if only I knew how to tie a silk scarf! Well, my friend, you are in the right spot. 1. Silk is a material that lives, and breathes. 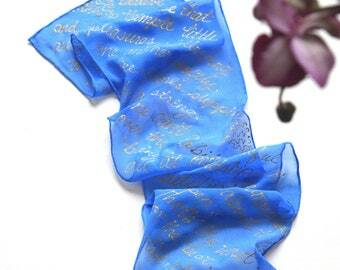 Unlike some cheap scarf you may spend a few bucks on silk will last, when cared for properly. Like any relationship with a living thing- silk is in this for the LONG haul. 2. Silk is for everyone. It has a vivacity and luxuriousness unlike any other natural material and it makes you feel happier just having it near you, with its gentle caress on your skin. 3. Wearing and tying silk is an adventure just beginning and with a few helpful tips, a few online videos and you will be wearing your silk accessory like a pro! Bright silk scarves and colorful neckties are just what you need to add a touch of luxury and class to your wardrobe! Questions? Write me there as well. 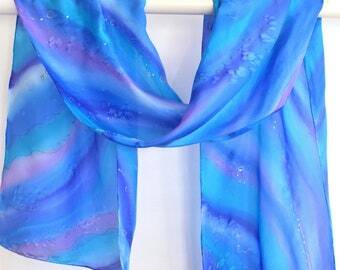 Silk scarves, neckties and veils handpainted for every occasion. 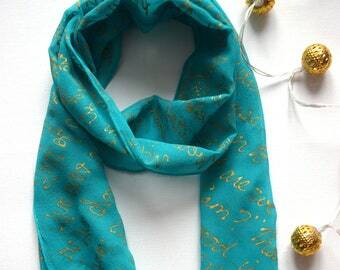 The scarf is beautiful, as pictured in the shop’s photo. I have other scarves from this shop and enjoy wearing them. I particularly like the Latvian birch trees. Hi! Just got the tie today!!! I absolutely love it!!!! And I'm sure my dad will love this special Christmas tie too!!! Thank you so much!!! THIS SCARF!!! Oh my heavens is it ever beautiful! This was purchased as a gift for a 5 year work anniversary, and it is breathtaking! My little helper cutting tags for orders. Every order is carefully packed with love from our little family business. 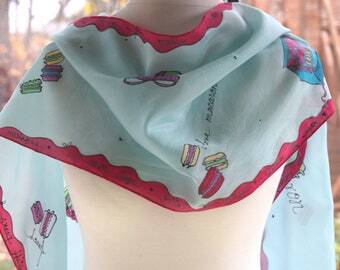 Putting on the Ritz with this fun silk scarf. Colors and textures for every occasion! Bringing blossoms to life on silk. Sometimes little hands want to join in! From the earliest memory of me, I was learning to create. From the moment my Grandma taught me to sew blocks together at age 2 I was hooked for life on making. My creative journey is forever expanding and growing and I was thrilled to begin painting on silk when a friend gave me my first lesson many years ago. Since then I have painted hundreds of scarves, and now I grab quiet moment between mothering 4 kids 9 and under and running them all the places they need to go. I use these still moments to create and make beautiful, ooak of scarves, neckties and even veils to make you feel so much more special. 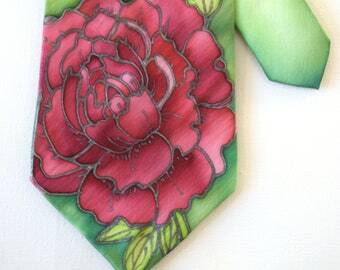 I enjoy working with brides on custom ties for their grooms, groomsmen, and father of the brides. Each order is unique and a joy to work on. Got a special event coming up, contact me with your ideas and we can come up with your dream pieces together! Greetings! I am Elizabeth and in the wild world of Mommy-hood painting is my calm and quiet. I love to create: sew, make music, paint, cook, bake, anything! My husband who does all the behind the scenes to keep my shop and new website (wwwdotritzysilkdotcom) running. The lady who taught me to paint on silk! Local artisans create these and sell them. 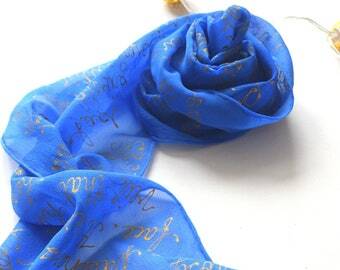 Each of my handpainted creations is intended to spoil you with a little bit of the luxury of silk. 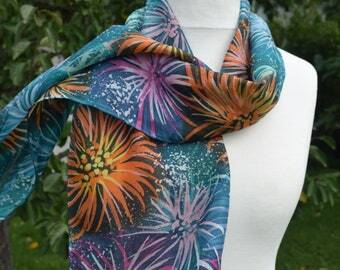 Indulge yourself or a friend with the luscious feeling of silk by choosing one of the many varieties of silk scarves I have to offer. Each item is made from 100% silk and painted with water based colors. When the creation is complete the colors are set by ironing and then rinsed to remove any residue. The art of silk painting is something that can be guided, but not controlled and therefore each so called "mistake" is a detail to add to the uniqueness of the finished item. These details are what makes each item truly one of a kind. If you have trouble checking out see this helpful guide. Other items can be returned within 2 weeks of arrival in their original condition- shipping will be paid for by the customer. Due to the possibility of items being lost in international transit I prefer not to have items returned and will do my best to work with you to come to a solution to any problem. Paypal and direct payment via credit card are accepted on all orders. If payment is not received within 3 days the sale will be canceled. Please include your telephone number at checkout for shipping forms so as to avoid delay in shipping. Items will be shipped within 2-4 days of cleared payment, unless your item is a custom order. Then it will be shipped within the time agreed upon. The cost of shipping includes packing and shipping. Should customs fees be required, the buyer will be responsible for their payment.Please note that items shipped could take apx. 7-28 days to arrive - keep that in mind when ordering. I am not responsible for lost or stolen items. Your item will have a shipping number and can be tracked. Silk comes in all varieties of textures and weights. I am continually trying new types of silk. If you want more specifics on the particular type of silk you are ordering, just drop me a line and I would be glad to tell you about its qualties. Custom Orders are welcome and I am happy to try and work something out with you. I would be glad to do special orders for weddings and other special events. Pre-payment is required on custom orders once we have come to an agreement on the details. Neckties can be ordered in the colors you need to fit for your wedding or other special event. You can even include a short message or logo on the reverse side of the tie for your groomsmen or Father of the Bride. 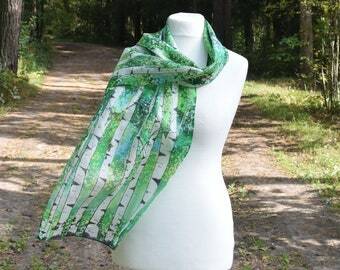 Scarves can be ordered in the colors and sizes you need and like. Each item comes nicely wrapped in a clear cellophane envelope. I can also include a handwritten note from you if this is to be a gift. Just include your note's message at checkout. 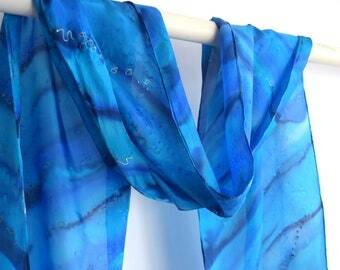 Hand painted silk scarves will be a bit wrinkly upon a arrival after their long journey through the post. -You can iron on the reverse side of the scarf if the scarf on the lowest setting (silk setting) using a mist of water on stubborn wrinkles. 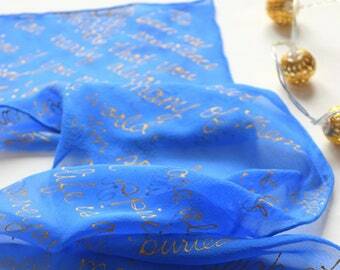 -Hand wash your silk scarf with a mild soap when needed. Do not wring. Line dry. Neckties should be spot cleaned only.